A Musical About Friendship, Hormones… and Popcorn. 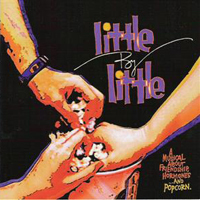 Litle By Little is the story of 3 friends and the love triangle that upends their friendship. By the show’s end, the three friends vow to move ahead, but with care and caution, learning to love Little by Little.